Microsoft outlook 2010 offers many new features and benefits which will help users save time and thus be more efficient. Take a look at a list of favorites from Telx, the IT services Miami Company. 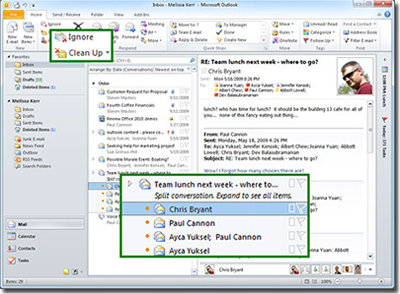 One exciting feature of outlook 2010 is Outlook Social Connector which links Outlook with various social networking sites. When one of your contacts updates his profile or changes his status on a social networking site, those changes automatically display in Outlook. Furthermore, outlook offers the ability to manage large amounts of e-mails with ease. Condense, categorize, or even ignore entire conversations with a few clicks. With new conversation management tools and the improved Conversation View, dozens of messages can turn into just a few relevant items. To start harnessing the power of Conversation View, go to the View tab in the Conversations group and select Show as Conversations. The improved Ribbon, available across Office 2010 applications, makes it easy to uncover more commands so you can focus on the end product rather than how to get there. The Ignore button that’s been added to Outlook is just what those of us who belong to lots of email discussion lists have been waiting for. It allows you to get rid of conversation threads that you aren’t interested in. Not only will it delete all messages in your Inbox that belong to the thread, but it will automatically delete any messages pertaining to that thread that come in later. Highlighting a message and clicking the Ignore button displays the dialog box shown in Figure E.
Finally, another great new Outlook feature is Quick Steps. This is a section on the Ribbon’s Home tab where you can create single-click links to perform tasks that normally require multiple steps. For example, if I want to forward a message to my husband, instead of clicking forward and then typing his address into the To box, I just click the To Tom link and the forwarded message appears with his address already entered. Figure G shows the Home tab of the Ribbon with the Quick Steps section highlighted. Telx computers offers a myriad of IT services in Miami. We can handle all aspects of your infrastructure, from server maintenance to application support and upgrades. Are you currently using an older version of Microsoft Outlook, call Telx, the premier IT services Miami company for an upgrade.